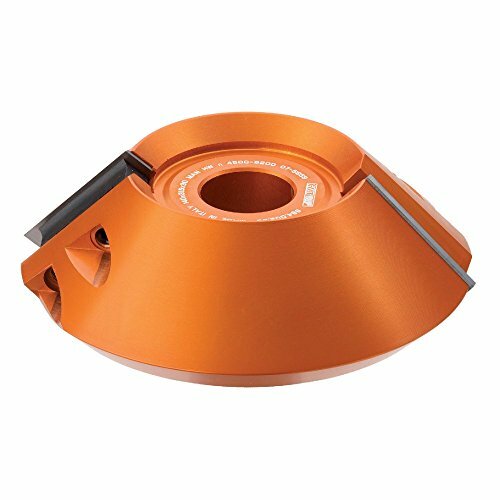 CMT Chamfer cutter head cuts clean, accurate bevels, chamfers and joints that are great for edge work. Excellent results in most materials but ideal on solid wood, veneer board and laminated materials. Tool features heavy duty aircraft aluminum body, 2 solid carbide knives, manual feed and pins for the automatic positioning of the knives. Heavy duty aircraft aluminum body, 2 solid carbide Knives (25x24.8x2mm). Pins for the automatic positioning of the knives. Cuts clean, accurate bevels, chamfers and joints that are great for edge work. Excellent results in most materials but ideal on solid wood, veneer board and laminated materials. RPM between 5100 and 8800.